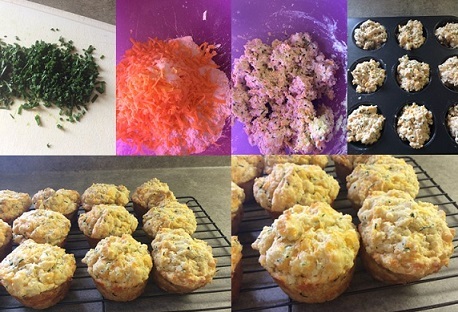 If you are a fan of cheddar cheese biscuits you must try my cheddar chive biscuits which takes the taste up one notch in flavour. I don’t know about you guys but I love cheese and so does the rest of the family. We often buy cheese when it’s on sale and freeze it so we always have cheese in the house especially for cooking. Adding cheese to biscuits seems like a natural thing to do but you can turn any plain biscuit into something magical in your mouth with a host of flavours sweet or savoury. My garden is now in full bloom with my veggies growing at extra speed with all this rain we’ve been getting. My chives have done exceptionally well considering I’ve left them out all winter long. Mind you it’s pretty hard to kill chives, spring onions and garlic. I have already cut them about 3 times and they continue to produce for me. I’m sure if I take them in over the winter with my luck things would be different. Tonight I am making my bruschetta pasta salad and these cheddar chive biscuits to go alongside this dish. I find the bruschetta pasta salad brings out the full flavour of the cheesy biscuits. Yes, I will share my bruschetta pasta salad on the blog now that I’ve mentioned it because I’m pretty sure you’re wanting to make it with this simple biscuit recipe. 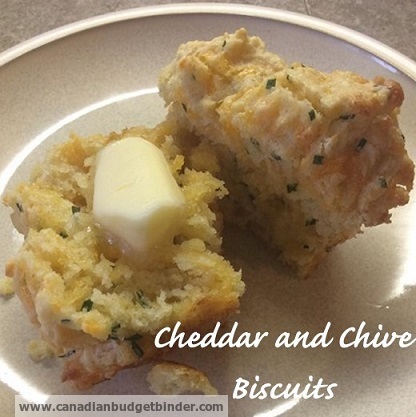 I make these cheddar chive biscuits quite a bit as they go with just about anything. My family enjoys them hot or cold with soup, salad, pasta and almost any main dishes. I have even made cheddar chive biscuits and topped it on a creamy chicken dish! The list is endless of what you can add into these cheddar chive biscuits. I like to put in jalapenos to spice them up and even sun-dried tomatoes just to give it an extra twist of flavour. You know me, I love to experiment with texture and flavours of foods I create. If you love bagels check out my bagel recipe and add in the above flavours to make a delicious snack. 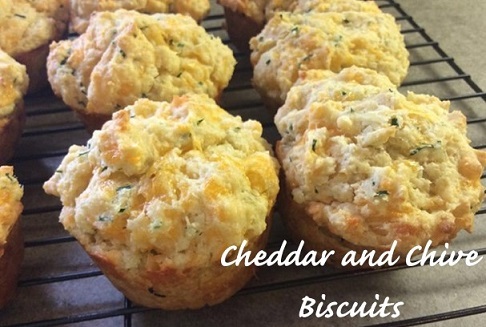 If you love cheese biscuits you will enjoy this simple biscuit recipe for cheddar chive biscuits. Blend all of the first 6 ingredients until well blended. Divide equally and put into standard greased muffin tins. Bake until golden brown in colour. There you have it an easy biscuit recipe to have on hand to accompany any meal whether it’s a salad or a meat dish or even to freeze for those unexpected guests that come around to visit. Ladies I make these all the time and they don’t last long in this house especially if they are just out the oven and smothered with butter! It’s a great biscuit for any meal lasagne especially I sometimes put in mozzarella in there too and some Jack too. The list is endless! We are odd to the town activities on Canada Day and then a baseball game the only one we will see this year as the boys will be busy with football! Chives are hard to kill indeed!! You can harvest and freeze them for the winter and just pull some out and chop to use in the winter. I’ve had chives seed themselves here and there in the garden so if you find a clump somewhere else in the garden just dig them up and pot for the winter too. If they make it through the winter, great…if not you still have the main plant going so,you are still good to go. My pot of chives made in through the last winter in the garage all dried out.we couldn’t get in to water but they still made it! !